Innovation is deemed crucial to sustained economic growth and welfare improvement. One may subsequently pose, as I do, that innovations require some sort of inequality before they can blossom. This does not mean that some people need to be kept poor so that others can innovate; it means that those individuals who have the potential to significantly improve things for society should be enabled (or left free) to act on that potential. 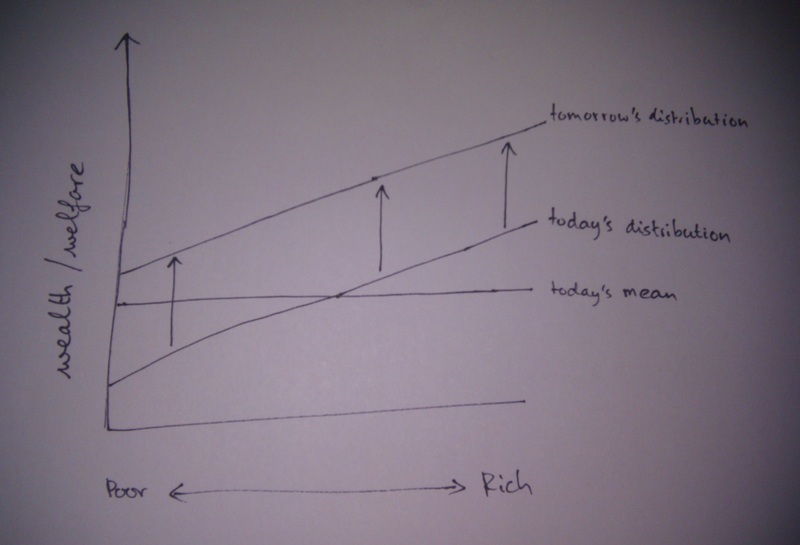 Thus, if we accept that today some inequities exist, which means that some are poorer than others, tomorrow the poorest (the “laggards”, on the left end of the graph) may be better off than the average today. The crucial insight is that inequalities are relative. Even though some may be better off relatively, everyone is better off absolutely.